The Microsoft OneDrive step of the wizard is available if you have chosen to restore data from a backup file located in the Microsoft OneDrive cloud storage. 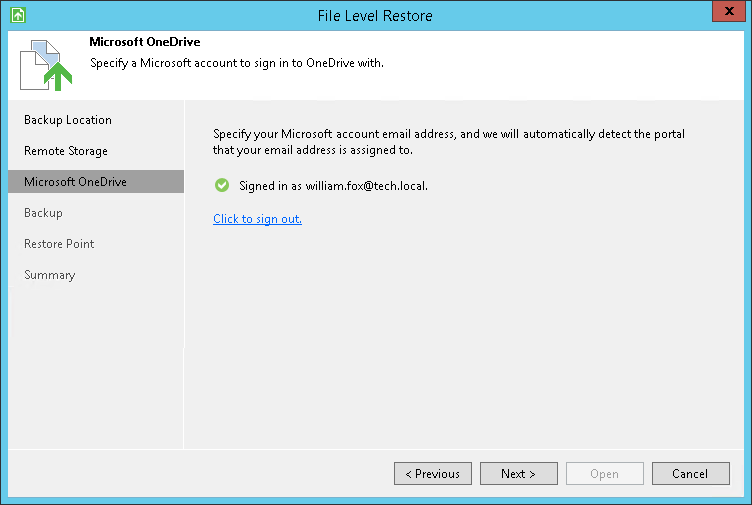 In the Microsoft OneDrive window, follow instructions to specify credentials of the Microsoft OneDrive account that has access to the storage where the backup file resides and click Sign in. If you want to change settings to connect to Microsoft OneDrive, click the Click to sign out link and repeat steps 1-2 to specify another account.